Every day, around 900 recipients will be eligible to lose their status now. Six months after Attorney General Jeff Sessions announced that President Donald Trump was ending the Deferred Action for Childhood Arrivals (DACA) program, Trump’s arbitrary March 5 deadline has finally arrived. The program, an executive action issued by former President Barack Obama in 2012, allowed certain undocumented immigrants who to came to the U.S. as children to legally work in the country without being deported; it protected nearly 800,000 of the 1.8 million undocumented people who met the DACA requirements. Trump viewed the program as “unconstitutional”—the rescinding of the program, and his setting of a six-month-out March 5 deadline, was supposed to be his push for Congress to find a legislative solution that allowed Dreamers, undocumented immigrants who arrived in the U.S. before age 18, to pursue a pathway to citizenship. However, after months of attempted negotiations, Congress has yet to pass any solution. Trump, who once stated he’d sign any bipartisan agreement that passed, has impeded progress by shooting down even the most promising of bipartisan-supported proposals for not including several of his desired anti-immigration concessions, like building a border wall and not allowing family migration. So now that March 5 is here, what is going to happen to DACA recipients? With the ending of DACA, pre-existing recipients with permits expiring before March 5 had only 30 days after the announcement (until Oct. 5) to reapply for their documentation, which lasts two years and must be reapplied for with a $495 filing fee each time. However, Dreamers who had never applied for DACA couldn’t apply, nor were people with DACA expiring after March 5 allowed to reapply. Since Oct. 5, each day an estimated 122 people have fallen out of their DACA status, making people who had given their information to the U.S. government with the expectation that they would be protected now deportable. Though Congress hasn’t made leeway, Dreamers themselves have been successful in helping one another. DACA-holder and immigration attorney Dulce Garcia, for example, is one of six undocumented plaintiffs in a lawsuit against the Trump administration for rescinding DACA. As an initial result of the suit, in January, and again in February, two federal judges ruled that U.S. Citizenship and Immigration Services (USCIS) must allow all pre-existing DACA holders to reapply for DACA regardless of when their permits expired while the case against the Trump administration plays out. On Feb. 14, USCIS announced that as a result of the federal court orders, it has resumed accepting requests to renew DACA for pre-existing holders. However, it’s unclear how long the injunction will last. And while it’s a small victory, the preceding months during which DACA recipients weren’t allowed to renew their permits may result in something of a backlog, Garcia previously told the Daily Dot. Furthermore, because permits take three to four months (and possibly even six months to a year) to process, involving a background check and an extreme vetting process, people who will fall out of status after the initial March 5 deadline who weren’t able to reapply during those initial 30 days will become deportable. According to Vox, the Migration Policy Institute estimates that between March 5, 2018, and March 5, 2020, an average of 915 people will fall out of DACA status each day. USCIS, meanwhile, estimates that 425 people will lose status daily this month, but that this pace will rapidly progress in the months ahead. However, because of the USCIS’s renewed acceptance of DACA renewals, it’s unclear just how many people overall will be affected while the injunction is in effect. For example, someone whose DACA permit expires on March 6 would not have been eligible to reapply between Sept. 5 and Oct. 5, since the permit expiration was not happening before March 5. However, even if someone applied for renewal in February, they would still have to wait a matter of months before being approved for renewal and being protected under DACA once again. In the meantime, this person becomes deportable. How are people responding to Congress missing the March 5 deadline? In Washington, D.C., DACA recipients, other Dreamers, and allies are protesting Congress’ inaction and the president’s broken promise made this time last year that DACA holders could “rest easy.” On Sunday, protesters with United We Dream, the largest immigrant youth-led network in the U.S., and the American Civil Liberties Union (ACLU) rallied in front of the White House, putting Trump “on notice.” As part of the effort, the ACLU launched a six-figure campaign to bring the issue directly to the president’s attention, including ads on Fox News’ Fox and Friends, CNN reported. At the rally, several undocumented people shared their experiences. Today we were live at the White House with United We Dream, allies, and activists to put President Trump on notice. He ended DACA, and now 800,000 young immigrants' lives are at stake. Today, several other organizations are rallying to bring attention to the passing deadline. United We Dream, along with eight other organizations including the Women’s March, Planned Parenthood Action, and the Fair Immigration Reform Movement are hosting an hours-long protest, again in Washington, D.C. United We Dream is also hosting local actions across the U.S.
Watch live as immigrant rights activists and progressives march and rally in Washington, D.C. to demand that Congress stops playing political games and protects immigrant youth now. What is Congress’ next move to helping Dreamers find a pathway to citizenship? While Congress failed to act before the March 5 deadline, lawmakers had made previous attempts at passing Dreamer legislation, including four different Senate proposals that all failed in February. And in January, amid months of Dreamer negotiations, DACA recipients and allies lambasted Democrats for folding on pushing Dreamer protections to be included in a government spending bill. 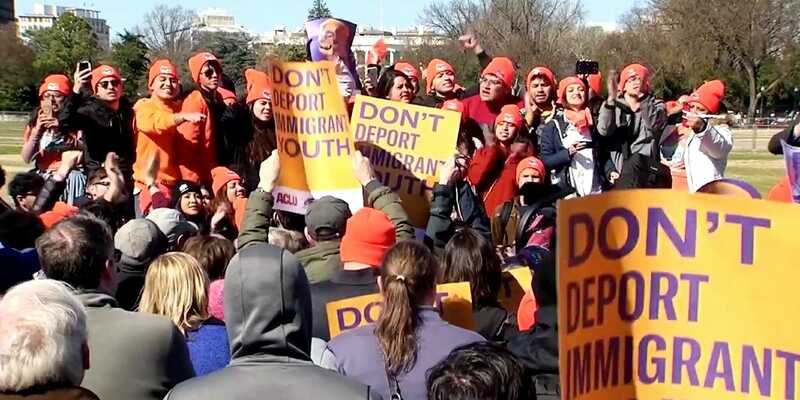 Royce Murray, policy director at immigration nonprofit American Immigration Council, told the Daily Dot that attaching Dreamer-related negotiations to the March 23 deadline on another spending bill may be Congress’ next best opportunity to act. And while previous bills for permanent measures failed, Murray said she thinks there are efforts to reassess Congress’ interest in temporary solutions to at least give Dreamers some assurances for the next few years. But given how difficult it’s been to find a bipartisan compromise for legalizing Dreamers (that also includes Trump’s anti-immigration demands despite activists’ calls for a clean DREAM Act), Murray said it will be difficult for any effort to pass as a standalone measure. A measure attached to the spending bill would also void any chance of the effort being “clean,” Murray said, as this spending bill would be funding the Department of Homeland Security (DHS), and subsequently funding Immigration Customs and Enforcement (ICE) agents, detention beds, and other resources that could potentially be used against Dreamers and their family members. House Minority Whip Rep. Steny Hoyer’s office stated House leaders would be releasing a statement later today. Democratic congressional leaders, Senate Minority Leader Chuck Schumer and House Minority Leader Nancy Pelosi, did not respond to the Daily Dot’s request for comment. At the very least, DACA recipients can depend on the lawsuits such as Garcia’s, one of many that have been filed against the Trump administration. But regardless whether the suit proves that Trump’s rescinding of DACA violated equal protection laws, a winning court case does not automatically grant DACA recipients and other Dreamers a path to naturalized citizenship. Garcia told the Daily Dot that she believes that with Trump having shut down the DACA program and rejecting several nearly successful bipartisan congressional efforts, any solution for Dreamers is up to him—and that includes a bill with his concessions. “I don’t know what any [new bipartisan proposal] would look like now unless exactly what Trump wants, and that’s what we’re fighting against,” Garcia said.